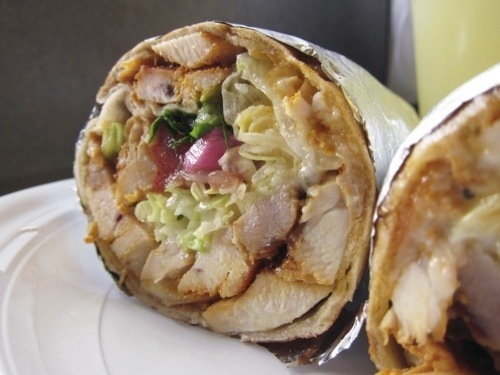 I crave shawarma, and if I were banished to a deserted island and told I could only eat one specific thing for the rest of my life, I'd probably pick shawarma. 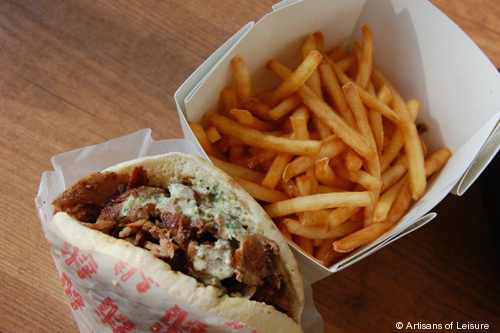 I'm picky, though: I adore the style of shawarma I encountered in Israel, and the best representations I've seen in the U.S. have been in places catering to the Kosher community. My all-time favorite is the one at Max's Kosher Deli in Wheaton, MD (a northern suburb of DC), but I've enjoyed others such as at Grill Point in Flushing, NY, Jerusalem in the UWS of NYC, etc. (You'll see lots of yarmulkes at both.) 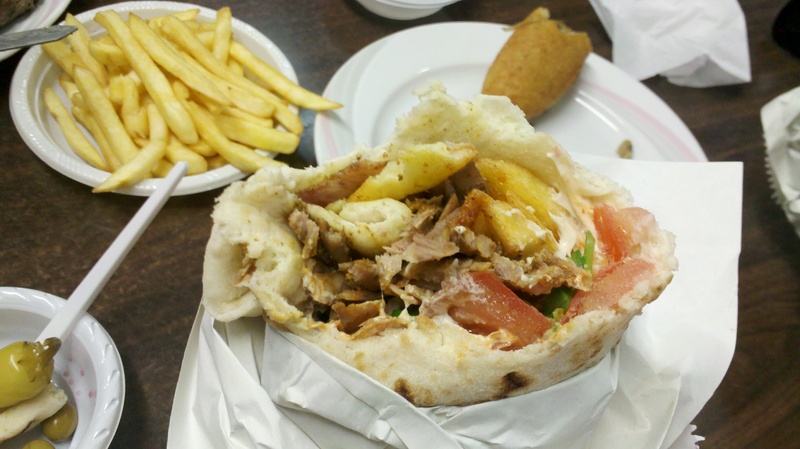 I've also had surprisingly good shawarma in both Vancouver and Toronto, though the barely-related "donair" found in the Maritimes is barely edible (the sauce is way too sickly sweet and not at all like the delicious döner kebabs you'll find in Germany and Turkey--if anyone knows of a place that does a good döner kebab, let me know, too--as best I can tell, the Doner Kebab House on Semple in Oakland closed down, and Turkish Kebab House on Forbes in Squirrel Hill doesn't really do actual döner kebab sandwiches). 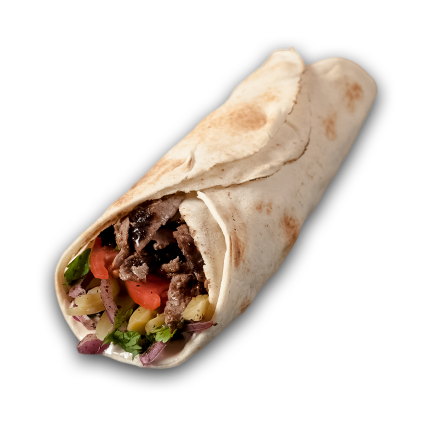 On the other hand, I really don't enjoy the other style of shawarma that I have had in a lot of Lebanese restaurants here in the U.S. and other places in the Arab world. -Usually much smaller, about the size of maybe an enchilada. You need at least a couple to fill you up. 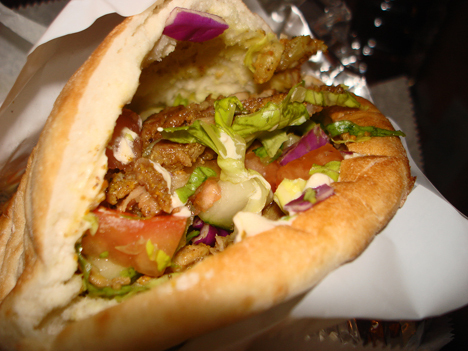 What I've found is that most places in the U.S. that serve shawarma tend to serve the latter, "Lebanese" type. I've had it (accidentally) several times at top-rated Middle Eastern (usually Lebanese) places in DC and even in Squirrel Hill, Pittsburgh, a heavily Jewish neighborhood (places with menus in Arabic thrive in Jewish neighborhoods there, I guess) as well as all over the the Middle East (the UAE, Oman, Qatar, Bahrain, Kuwait, and even Israel's neighbor, Jordan--I tried three places in Aqaba and was unable to replicate the style of shawarma served right across the border in Eilat). On the other hand, I've found the third-best shawarma I've ever had in the U.S. at a place in San Luis Obispo, CA, Petra, owned by a family from Jordan, but it's definitely the Israeli-style one (though my favorite of theirs is the locally-inspired tri-tip shawarma). 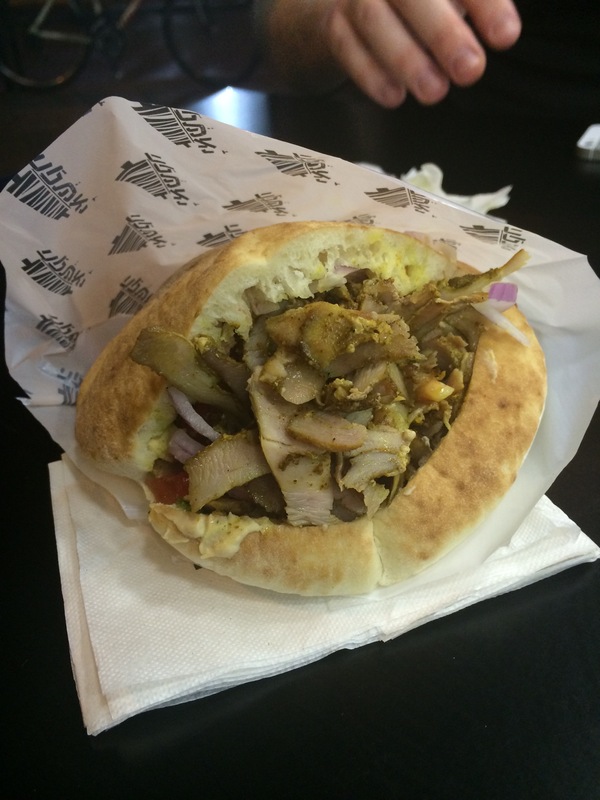 So maybe Jordan isn't all Lebanese-style shawarma. 1) Can any shawarma experts help me refine the differences between the two styles of shawarma I've described above, perhaps correcting the terms I've used and names of specific ingredients? James Beard-winning chef Michelle Bernstein hangs with Billy Harris at Michy’s in Miami. Before making Sweetbread Shawarma, they discuss Bernstein’s background and the changing food culture of Miami. Surprisingly, Bernstein has never made this dish before! In Hanging with Harris, Bill Harris takes viewers into the lives of interesting people and learns something in the process. It’s always Billy. It’s always interesting, and they’re always, Hanging with Harris.